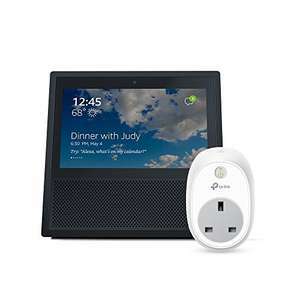 Simply add echo show and Smart Plug separately. How when the show is £99.99 on its own? See my deal here and follow the same instructions. Just add both the base Deal of the Day separately. I wonder if I cancel and order this deal will STUDENT15 code work again? Oh, just ordered Echo Show on its own for £99 (-£15 with STUDEN15 d …Oh, just ordered Echo Show on its own for £99 (-£15 with STUDEN15 discount) :-/I wonder if I cancel and order this deal will STUDENT15 code work again? No don't think so, I think it will only allow you to use the deal once. I've been stung by that before so am presuming it's the same. Code is once use only. dont do it! I cancelled an order, and the student discount was reapplied. It also worked for me: cancelled and ordered again -- student15 code was automatically to the basket, so all went smoothly. All the reviews I read/watched say Show sounds the best in the whole Echo lineup of devices. which I use to connect one of my Echo Dot's too, all these Echo devices have Bluetooth. I find it incredible I can pair it up with that receiver and just command which songs play by asking Alexa. That receiver is 100% reliable, you just have to remember to switch it off when you're not using the speaker otherwise the Echo device will automatically be routing the audio through it. Dead easy to use. When it's on Echo device uses it, when it's off the Echo device uses it's own speaker. There's other recievers with better BT support such as AptX I haven't checked if Echo devices support AptX though. I just know this receiver works for me. I've got one of these > …I've got one of these > https://www.amazon.co.uk/Bluetooth-Streaming-Wireless-Receiver-Speakers/dp/B01CZVCYU0/ref=sr_1_5?ie=UTF8&qid=1531774397&sr=8-5&keywords=bluetooth+recieverwhich I use to connect one of my Echo Dot's too, all these Echo devices have Bluetooth. I find it incredible I can pair it up with that receiver and just command which songs play by asking Alexa. That receiver is 100% reliable, you just have to remember to switch it off when you're not using the speaker otherwise the Echo device will automatically be routing the audio through it. Dead easy to use. When it's on Echo device uses it, when it's off the Echo device uses it's own speaker. There's other recievers with better BT support such as AptX I haven't checked if Echo devices support AptX though. I just know this receiver works for me. We need a speaker that has a USB power port on it that when the speaker goes into standby it cuts power to the USB port thus disabling the Bluetooth. Even Bluetooth speakers aren't great with the echo, it's much better to get the big Echo because then it just works and you don't need to worry about power consumption of a speaker that's left on, its just a shame the sound quality sounds like the speaker is made of wet cardboard. Can anyone use the 15% student discount? Same here.... can anybody use the 15% off as it does not work for me!!! Guess can't get them for 99 anymore? A bit worrying to see no Retailers even bothering to challenge Amazons prime day with their own deals. Now Tesco direct have gone will they concentrate on putting all the other big online retailers out of business, most likely and what happens when theres little or no real opposition. Showing as £117.48 for me, sadly. It's cheaper to buy the bundle - that only costs £109.99. No it works fine, not had an issue, just have to remember to switch it off when I don't want the audio routed through the hifi, if the hifi is off then I won't hear Alexa's replies.